Aw compas. It always surprises me the sensation of its drumming feeling, the biggest threat to any flamenco dancer is to be out of compas. The magnitude comes from deep within our soul, and we have to feel the compas and never erase it from our minds. Like the seasons-spring, summer, fall and winter, it comes and goes. So it is with compas, its rhythm varies from palo to palo, and you better learn them all or you’ll make a full of yourself dancing. It will be no surprise to find the dancers with their own metronome to find the correct compas as they practice. Today, even on my mobile phone I have my own metronome app to help me in those days of practice at home. You can compare them as learning to ride a bike, everything requires time and practice. 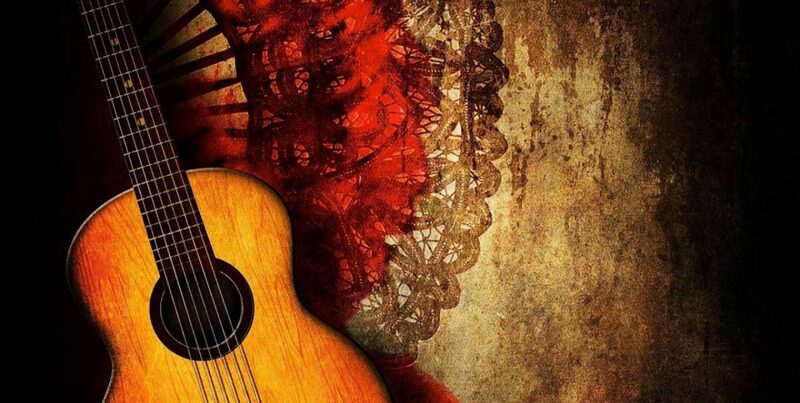 Eventually you will hear a compas of a song and will be able to say which form of flamenco it is. For me it is so rewarding to know which one is an Alegrias, a Solea, or a Buleria. I am excited for our fall program. We will learn this time Siguiriyas. In this palo, you will get to the darkest part of your soul. A time of healing can come with this form of flamenco. Siguiriyas derived from flamenco’s earliest root forms, the tonás, Siguiriyas is one of flamenco’s oldest and deepest forms. Its name is a corruption of the term seguidillas, a group of 18th Century songs and dances. Siguiriyas first emerged in the 18th Century in Cádiz, Sevilla and Jerez de la Frontera. Slow, majestic and tragic, Siguiriyas is the most jondo of cante jondo forms. Its lyrics focus on tragedy, inconsolable sorrow, and pain. (I found out recently, this is my teachers’ favorite palo she explains it is like the equivalent of deeper sadness, like cutting vains of flamenco, for its dark, and powerfully tragic lyrics. In this I see her sharing her soul in performance). The summer months brings us to an understanding that even if we are bored at work with our daily routines and we wish for those moments of carefree enjoyment, we should never forget that as flamenco, we will be back on the floor to practice by the fall, and the time to play games and enjoy the sun will be gone with the first feelings of the morning cold by October, which will make us regret not to enjoy those summer months. I must leave you all with this note: enjoy those days of summer, go outside at least for five minutes to embrace the heat and the chirping of birds. Dance as if you were a flamenco dancer, full of passion, love and happiness. Find your nearest flamenco show, it could be in a restaurant, and clap while you listen to the compas. Try to find the compas yourself, maybe you’ll find out the “Duende” in you. Life is too short, and soon you will be back to the rhythm of work responsibilities and cold environment that life brings to us all. I would like to hear if you have found your Duende, and if you have visited a flamenco show lately. It would be wonderful to exchange experiences through this blog.